Complementary and alternative therapies include treatments not considered in the mainstream. Many are used in addition to conventional medicine or as an alternative. Acupuncture was first used in ancient China, as early as 960AD. The word acupuncture derives from a latin word (acus) meaning ‘the needle’ and is described as ‘puncturing of bodily tissues for the relief of pain’. Acupuncture is performed by inserting needles of various lengths and diameters into specific points over the body. The needle is usually inserted, rotated and then either removed immediately or left in place for several minutes. These acupuncture points exist along lines called meridians. The ancient Chinese believed that the health of an individual is determined by channels of energy, known as Qi, which flow beneath the skin. If the flow of Qi is disturbed then we may develop illness. The aim of inserting needles is to restore this flow of energy. 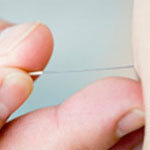 Acupuncture is also thought to be beneficial in the treatment of migraines, nausea, and arthritis to name a few. There is a lack of scientific evidence to either back or refute the use of acupuncture. This is because of the difficulty in testing it, firstly due to the disability in proving the existence of Qi and secondly in testing the effectiveness of acupuncture against a placebo. In order to complete a reliable study, both the practitioner and the client must be unaware of whether they are receiving real or ‘sham’ acupuncture. This is impossible to achieve, as the practitioner will always know, and the client can usually tell if a real needle has been inserted. Any research performed with retractable needles (the closest thing to a placebo) has shown that there is no difference in effect! Acupuncture is a relatively safe treatment, providing certain guidelines are followed. These mostly involve the use of a needle to pierce the skin in terms of avoiding infection and cross contamination. All acupuncture practitioners must be a member of each nations governing body for acupuncture which includes indemnity insurance. The safest way of finding a practitioner is by using the governing bodies website. Acupressure is a soft tissue technique which uses the same pressure points as acupuncture but uses pressure from the fingers instead of needles. It is a form of treatment which has developed from traditional Chinese medicine. It uses the fingers and thumbs to apply pressure to certain points in the same way as acupuncture, just without the needles! It stems from the belief that the energy flows throughout the body in channels known as meridians. Acupressure points lie along these meridians. In traditional Chinese medical theory, if one of these channels becomes blocked or out of balance, then injury or illness occur. Acupressure is traditionally thought to help unblock the meridians and allow a free flow of energy within the bodies channels. Acupressure therapists do this by applying direct pressure to specific pressure points, using their thumbs, fingers or even their elbows! Acupressure is performed over the top of clothing and so is not intrusive at all. Pressure ranges from gentle to firm and is held for anywhere between 30 seconds and two minutes. The pressure may be gradually increased, held and then gradually decreased throughout each pressure point. Many western medical professionals do not agree with the traditional theory behind how acupressure works. However, they do not deny that it does seem to have some benefits. Instead, they contribute any successes to increases in circulation and the production of endorphins, as well as a decrease in muscle tension. Aromatherapy is the use of essential oils in holistic treatments to promote health and well-being. Essential oils are natural substances, obtained from a plant source by distillation or expression. There are over 400 essential oils, many of which have been in use for hundreds of years due to their therapeutic properties. Each individual oil is known for having a certain effect and these can be used individually or in combination. The most common form of aromatherapy is though massage. Here the oils are used to allow the therapists hands to glide smoothly over the body. Other alternative forms of aromatherapy include inhalation and adding a few drops to bath water. Many studies have shown the effectiveness of certain essential oils. For example tea tree has been shown to be antibacterial. Other studies have shown positive effects of aromatherapy on mood and the sense of well-being. Floatation is a method of rest and relaxation. It consists of floating in a 10 inch solution of Epsom salts. Floatation is a method of rest. It consists of floating in a 10 inch solution of epsom salts. The solution is maintained at normal skin temperature of 93.5 degrees Celsius. The buoyancy of the salts solution allows your body to be supported on the surface of the water giving the impression of zero gravity. After floating you emerge refreshed and relaxed both physically and mentally. Floatation can help reduce pain, help backache, and muscle injuries and relieve stress and anxiety that often accompanies an injury. The athlete emerges from the flotation pod alert but in a state of deep relaxation. The effects can last anywhere from a few hours to a few days. Sessions usually last about an hour. The athlete will shower before entering a floatation tank. Place earplugs in the ears to prevent saltwater from getting into the ear and crystallizing. The lid of the floatation tank can be left open or closed and lights can be on or off. The athlete will simply lie back and due to the salt water (just like the Dead Sea), they will float along the surface of the water. Music can be played or just left silent leaving the athlete to concentrate on relaxing. Sports psychologists are aware of the benefits of regular relaxation. it balances the autonomous nervous system, reduces stress and anxiety and with practice can be applied to sports specific situations to enhance performance. Just like training, the ability to relax improves with practice. Regular relaxation will mean the athlete is more likely to be able to relax faster and more deeply than on the first occasion. Indian head massage is an alternative therapy which involves massage to the scalp, neck, face, and shoulders. The technique has been developed from the Indian system of Ayurvedic healing which is an ancient Hindi form of treatment. A more modern view of Indian head massage suggests that its benefits are limited to relieving stress and tension in the neck and other muscles as well as improving blood flow to these areas. This alone can be effective in easing headaches, neck pain, and stress. It is also thought to help with concentration and stimulate hair growth! The word myofascial comes from the Latin words ‘myo’ meaning muscle and ‘fascia’ meaning band. Fascia is a connective tissue, also sometimes known as fibrous bands, which surrounds all muscles, tendons, ligaments, bones, and organs within the body. The fascia consists of a network of hollow tubules made up of collagen and elastin. Fascia itself is very strong, flexible and dynamic and so responds well to stretching. The fascia loses its elasticity through physical and emotional trauma and poor posture. This results in the fascia hardening and the general flexibility of both the fascia and the muscle it surrounds, decreases. What Conditions can Benefit From it? Reflexology is a type of massage and pressure applied to specific points on the hands and more usually, the feet. The reflex points within the foot relate directly to an area of the body, with the right foot corresponding with the right side and the left foot, the left side of the body. This treatment has been used for thousands of years and is believed to allow the practitioner to treat the body as a whole because the whole of the body is represented on the feet. It was introduced in the form we know now in the 1920’s using the theory of zone therapy. Reflexology does not claim to be a ‘cure-all’ form of treatment. Successes are however seen regularly with conditions such as migraines, breathing problems, hormone imbalances, sinus problems, digestive and circulatory issues, back pain and stress. It is not known exactly how reflexology is thought to work, although the theories of its practitioners state that the body contains a life force known as Qi which can become blocked. Reflexology is thought to clear these blockages. The release of endorphin’s and an increase in lymphatic flow are also thought to be benefits. Reiki is pronounced Ray-Key and is a Japanese form of spiritual healing. It was developed by Dr. Mikao Usui in the early part of the 20th century. Throughout a Reiki treatment, the client remains fully clothed and the practitioner places their hands in a series of positions over the body. The whole body is treated during a session, not just the injured or affected area. Reiki masters teach their students the methods used in Reiki. Their teachings say that there is an ‘inexhaustible, universal, life force spiritual energy’ which can be used to produce a healing effect. According to a Reiki master, anyone can gain access to this energy, via a process called attunement. The energy is then believed to flow through the hands whenever the practitioner’s hands are held near or on a client. Treatment will usually progress with the practitioner moving their hands from one specific position to another, and holding each position for between 3 and 5 minutes. Areas usually covered include the head, back, stomach, knees, and feet. Between 12 and 20 positions are used and treatments, therefore, last for 45-90 minutes. Clients often report feelings of warmth and tingling on areas being treated, even when the hands are not in contact! There is no scientific evidence available to support the effectiveness of Reiki and especially the presence of the life force energy described in Reiki teachings. However, many dedicated therapists and satisfied clients may disagree! Shiatsu is a Japanese word meaning ‘finger pressure’ and was developed in the early 1900s by a Japanese practitioner called Tamai Tempaku. Shiatsu combines traditional oriental treatments with western medical knowledge. Shiatsu is a relaxing treatment which can support individuals in moving towards greater health and well-being. Shiatsu is a very simple and slow practice which uses few techniques. The most common involves applying gentle pressure with the hand, thumb or elbow. Shiatsu is most commonly used in the treatment of headaches, whiplash, back pain, neck pain, stress, joint pain, and sports injuries. There are many different styles of Shiatsu today. Some focus on acupuncture points (similar to acupressure), some on the energy channels and others on diagnostic systems (e.g. the five elements). Zen Shiatsu is probably the most famous variant, and this is an extended form involving special exercises known as ‘makko ho’ to ‘stimulate the flow of Ki’ (Qi or Chi). Zen shiatsu was named after the simple and direct approach to spirituality of the Zen Buddhist monks.